The Beverly Animal Natural Health Center was founded in 1998 to offer an approach to patient care that focuses on wellness in addition to caring for your pet when ill. We special in cats and dogs offering comprehensive examinations as well as utilizing state of the art diagnostics and treatments. Dr Nancy Crowley and Dr Lynne Ricketts have over thirty years of experience caring for your pet through all life stages. We treasure the relationships we have with our patients and clients. Our approach to treatment plans is holistic. We draw from various methods that are available and select with our clients the one that is the best for the patient not only in the short term but long term as well. Our blend of cutting edge technology and resources combined with compassionate, patient driven care makes our work very rewarding. We love to educate our clients to be an advocate for the health of their pet and be well! The holistic approach means focusing on the patient as a whole in their everyday environment and factoring in nutrition, activity, and socialization to offer the best treatments. We incorporate this approach for all our patients seeking routine preventative care as well as for surgical and medical care. Pups are getting some play time in the snow and I am recharging every weekend playing in the snow as well. 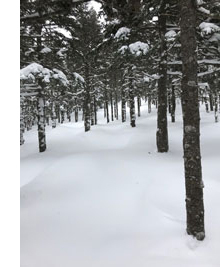 I am a New Englander that loves winter. Things are bustling here at the clinic with our continued drive and vision to make our patient care the best for all our patients. My goal is to enhance pets and peoples lives through daily actions that improve quality of life. 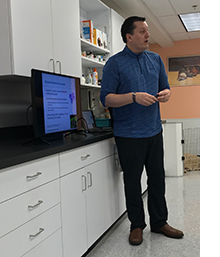 We have been working on staff education to promote wellness and preventative care to make pet’s lives healthier and owners lives even more blissful for sharing it with a pet. We will be working with senior students from Beverly High School and Essex Technical High School this spring as they extern with us to explore careers in veterinary medicine. These programs give us the opportunity to give aspiring veterinary students a real peak into the daily life as a veterinarian. There is so much more than dogs and cats. The profession is one that has evolved tremendously since I first started at Village Vet Clinic in Brookline when I was a teen. Happy to say my coworker and I both reached our goals to become veterinarians and still connect on Facebook. Ah, the chores of washing syringes for re-use and doing messy laundry at the local laundromat. I remember the pets taking hours to recover from surgery… not a single monitor except us. We have surely made strides in pain control and anesthesia! There have been so many advancements with medicine and surgical care. Technology has surely made a mark for better or worse. The paper records are a dated symbol of my age but just a few weekends ago, over 2000 clinics across the country were unable to access patient info due to a technology “glitch”. This is just days after having one of the largest pet food companies, Hill’s Pet Food diet have a recall due to excess Vitamin D in so many of their prescription foods. Corporations are buying up clinics on a daily basis. There is more suicide in our profession due to fatigue, burnout and debt load. We have had such high turnover of drug representatives and back orders for life saving medications. Here at BANHC, I am so fortunate to have had Dr Ricketts as my associate for seventeen years and counting. The continuity of care that we have been able to achieve with our clients is par none. The relationships that we have been able to develop with our colleagues at BluePearl, Idexx and Angell truly change lives of both our patients and their owners. These personal relationships with accountability is what makes BANHC. We appreciate entrusting the care of your dog and cat with us. Have you checked out your PetSite? One technology item we have embraced is PetSite. This free online service allows you access to your pet’s healthcare. This helps to check appointment times, get text reminders as well as request refills. Super helpful to check vaccine status for grooming and boarding. We can get non urgent messages. Laboratory test results are also available. You can personalize your page with pet photos. Please check it out directly at our website. We really appreciate the text confirmation responses! This fall, there was a significant increase in the number of Lepto cases reported to the state. There were a number of cases on the North Shore, including two here at BANHC. Leptospirosis is caused by a spirochete bacteria that is transmitted through infected water sources or urine. Infected wildlife such as rats and raccoons are the source of the infection. Dogs come into contact during a wet fall season. They may come in contact with urine or water source such as a puddle that has been contaminated. Dogs become sick with lethargy and fever. Increased water intake with a decreased appetite are common signs. We are now recommending the leptospirosis vaccine for all our canine patients. If your pet is not due for any other health care needs at this time, we would suggest vaccinating as it is a two part series so their immunity would be attained before the season (July-December) comes around again. 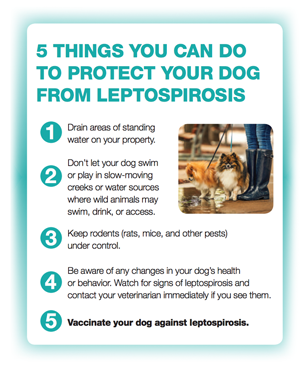 Click here for more info about Leptospirosis. We like to celebrate pet dental care every day! From chicken flavored toothpaste, dental wipes to cinnamon bun water additive, please check out our selection here at the office. 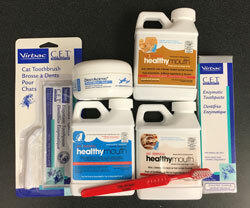 We have great handouts and check out our new section on pet dental health on our website. Our preferred emergency hospital: Blue Pearl 781-684-8387 180 Bear Hill Road Waltham, MA 02451 Click here for other local emergency hospitals. Sign up today to receive newsletters & helpful information by email!